On a cross country trip the water pump on my 2016 Road Glide failed. I was just outside Reno, NV and I called Colonial Harley and spoke to Dave in the service department. I was told I could safely continue riding. I stopped in Grand Island, NE and had the water pump replaced. After having the pump replaced whenever I shut the bike down it would push coolant out the overflow. I called Colonial again and Dave advised to check the radiator cap. Sure enough it was not fully secured. I tightened the cap, stopped at a Harley dealer in Indiana and topped off the coolant and pressed on. It is truly reassuring to know that when you need help you can call and get dedicated, knowledgeable people that can and will give you the help you need. The folks in Service at Colonial know Harley's! Everyone at Colonial from MotorClothes, Parts, Sales and Service are knowledgeable, helpful, and dedicated to getting it right when helping you. 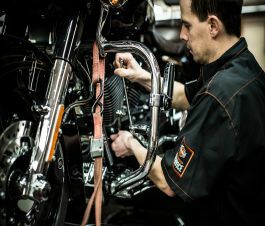 If you're considering buying a bike, riding gear, parts for your bike or having it worked on, Colonial Harley is the only place I would recommend.